As a huge fan of Korean cinema, I have been a long time supporter of Old Boy director Park Chan-wook (recently I wrote this article for the film society Mini-cine where I discussed, in more depth than I will here, his career to date and the history of the industry in his home country). When Park Chan-wook announced his latest film was to be based upon a script from Prison Break actor Wentworth Miller, not an actor who had previously been known for his literary flair, many eyebrows were raised. Whilst the former is widely, and correctly, regarded a visionary and master of his medium, the latter was considered an unknown entity in the field and, in order to create a tale suitable for framing by the Korean talent, Miller would have to show an appropriately prodigious previously hidden level of story-telling intelligence and nous to create a work of suitable levels of quality. Watching Stoker, the following two things become instantly apparent. Miller is an incredibly lucky man. His screenplay is schlocky and nonsensical, empty and superficial – it’s a below average attempt at writing a “psychological thriller” and it is victim to the ludicrous excesses which make much of the genre open to mockery. Had this script not fallen into the hands of as skilled a craftsman as Park Chan-wook it is unlikely that Miller would ever be green-lit on a second script unless he could find a way of moving past the sub-Hitchcockian drivel which means that whilst the story meanders, twists and turns, it doesn’t actually arrive at any kind of meaningful direction throughout the duration of the feature. The second conclusion to draw is that Park Chan-wook is indeed one of the finest directors working in the world today. Whereas it has often been said that the main thing a director needs to make a good film is a great script, it is also possible to use a form of this logic to see how great a film-maker is when they are working from sub-standard material. Whereas much of Park’s oeuvre features Shakespearean rushes, Machiavellian twists and labyrinthine cerebral journeys, he is at his most challenged here with a threadbare tale of woeful nothingness. Yet, making the tale become much more than the sum of its parts, in Park’s hands each scene drips in real terror, beautiful anxiety permeating through the screen as the audience are led on a seductive, mesmerising dance and simple acts such as the slow removal of a belt become gutturally devastating in their ominous intents. Park’s visual flourishes are on display here too and a cut from brushed strands of hair to a Twin Peaks-esque field is one of the many breath-taking and bravura pieces of film-making on display. 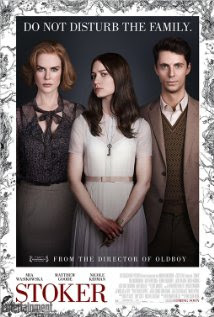 So, whilst the film, thanks to the incredible imagination of Park Chan-wook, does not descend to the depths it should (and on paper I can imagine this reads like a sub-Butterfly Room piece of trash), the main problem with Stoker is that it represents and incredible wasted opportunity. Park has certainly continued his rich vein of form in terms of his own run as a director but what he is doing near such a substandard script is anybody's guess.